When planning for a sequence of lessons it is important to select and make effective use of learning and teaching resources, including textbooks, to enhance student learning. Mathematics teams in schools need to select, adapt and develop resources to support their students’ learning. Effective use of resources will help students to consolidate what they have learned, extend and construct knowledge for themselves and develop learning strategies and skills for learning. There are many free learning and teaching resources for mathematics on this website. All these resources are linked to the relevant learning topic from the syllabus and may be accessed via Junior Certificate resources and Leaving Certificate Resources. In addition to these resources there are also commercial resources available. 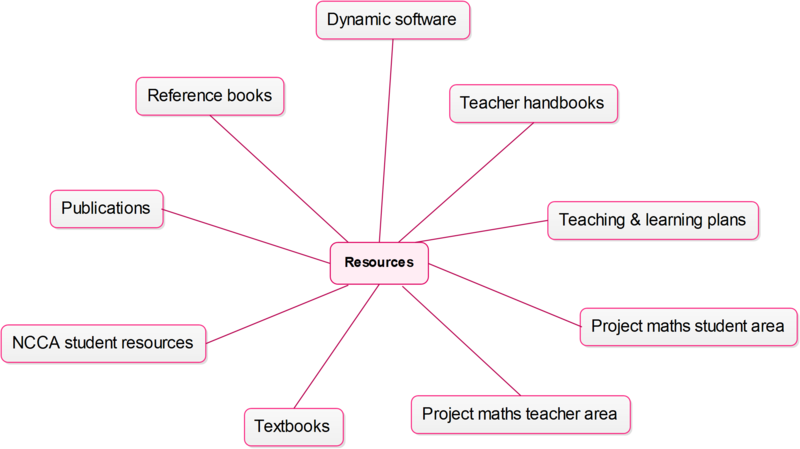 An overview of some of these resources and their usefulness in a maths lesson is provided below. The NCCA website has its own student area where students can access a wide variety of resources including videos, sample questions, examples of student thinking. All of these resources should be drawn on to help students learn and broaden their learning experiences. All resources need to be adapted to meet the different needs and abilities of students. In addition teachers are advised to develop their own teaching and learning materials for this purpose. Proper use of resources can make teaching and learning more effective, dynamic and interesting. It is advisable therefore to build up a suitable stock of resources including those listed above. If space is available in a school, resources should be displayed for teachers’ information and perusal. An alternative idea is to have a mathematics press available for teachers to access. A system should be developed to keep track of resources being borrowed at any particular time. An up-to-date list of resources available should be easily accessible for all mathematics teachers. Teachers should be encouraged to use the resources which are available or have been developed. Teachers should also make suggestions for future procurement. It might be an idea to conduct small in-house workshops, demonstrations or sharing of experiences on the resources to provide all teachers with a better appreciation of the resources available within the school. Teachers can also share what they have developed themselves at such sessions. – They should be in line with the learning outcomes in the syllabus. – They should take students’ prior knowledge into account. – They should present concepts and ideas in an active and effective way. – They should engage students actively in learning. – They should provide knowledge but also scaffold learning. – They should provide for students’ differences by offering varied learning activities at different levels of difficulty. – Resources used to complement textbooks should promote and extend independent learning in addition to what was learned in class. – They should facilitate discussion and enquiry.